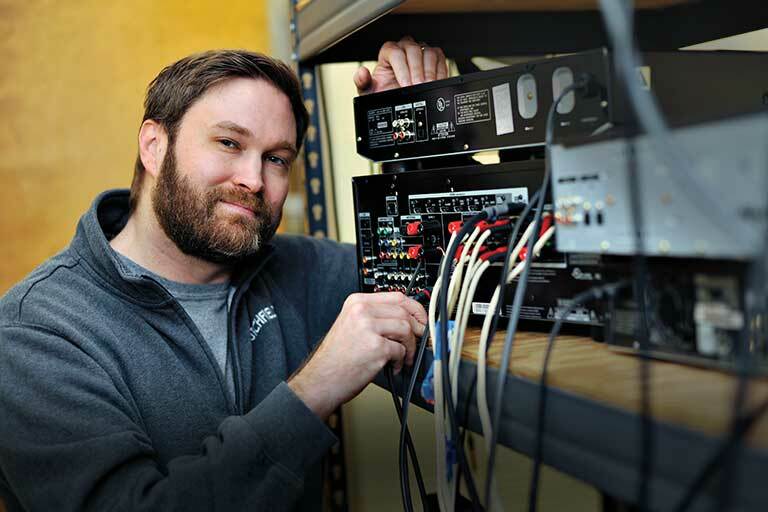 Our Crutchfield speaker wire with pre-attached banana plugs provides an easy, secure connection between your speakers and receiver or amplifier. The speaker wire is 14-gauge oxygen free copper, and is covered in a flexible nylon jacket. The barrel of each connector has a red or black finish, to easily identify positive or negative. The positive and negative speaker leads are independent from one another, and are held together by multiple plastic sheaths that can be removed. Note: This package includes a single speaker cable to connect a single speaker. You will need to purchase two of these cables to connect a pair of speakers. High quality product and delivery was quick. No complaints. Can these connectors be replaced with pin connectors? The banana plugs are removable with a small flat head screwdriver. about an inch or so of wire is exposed underneath of the plugs. Crutchfield Speaker Wire w/ Banana Plug Connectors: The Crutchfield speaker wire w/ banana plug connectors provide an easy & secure connection between your loudspeakers and receiver or amplifier. The speaker wire utilizes OFC (Oxygen Free Copper) and a flexible nylon black/silver jacket. The positive and negative speaker wire leads are independent from one another and are held together by multiple plastic sheaths that can be removed. The speaker wire is terminated by banana plug connectors on each end. Each banana plug connector features a gold-plated single-banana jack which easily plugs into the binding-post or spring-post terminals of your loudspeakers, receiver, or amplifier. The barrel of each connector is "Red" or "Black", so you can easily identify positive & negative. Note: This package includes a single speaker cable to connect a single loudspeaker (not a pair). 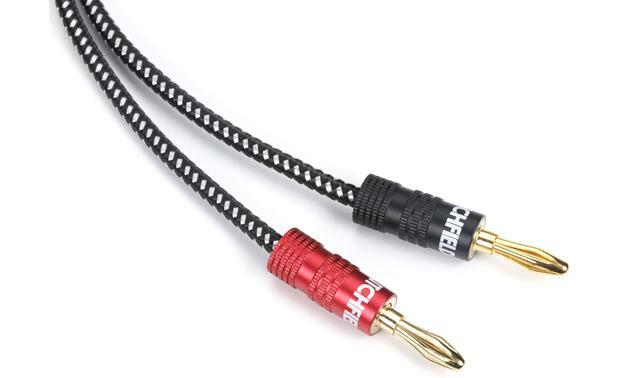 You will need to purchase two of these speaker cables to connect a pair of speakers. How many strand wire is in each conductor? Not sure as my speaker wire has banana plugs. Strands vary from 71 to 295 in 14 ga wire. This would probably be a question for a Crutchfield specialist. I can tell you that this wire and the banana plugs are very good. I'm worried about the braided outer sheath. 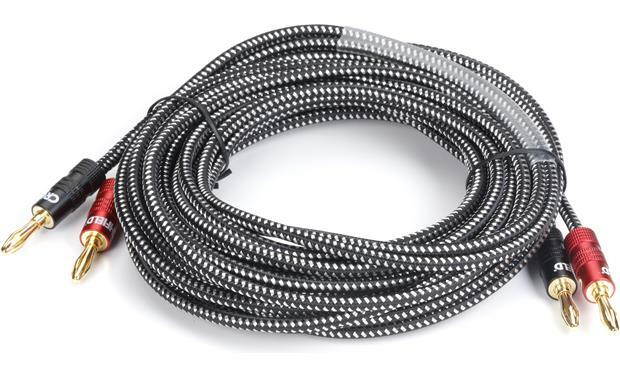 I purchased a cable with a braided outer insulation, and it felt like glass. The cable tore up all my furniture like a giant rat-tail file, as I pulled it to my speakers. I had to return them. Is it smooth, not coarse? I have not experienced any problems. I did not experience any negative effects of running this speaker cable. I find it ribbed but not coarse. Feed it around furniture slowly and carefully and you shouldn't have any problems. These cables produce sound as good as speaker cable costing a lot more. can this speaker wire be ordered in longer lengths? 20ft is the longest available in the Crutchfield brand wire with the pre-attached banana connectors. That would depend on the posts or receptors on the back of your speakers and the speaker contacts on the back of your amplifier/receiver. I selected these with banana plugs because the posts on my speakers were designed to accept banana plugs as well as the speaker contacts on the back of my amplifier. I prefer banana plugs or wire with no pins or plugs because I feel that makes a better contact. Not all speakers and amplifiers will take banana plugs. Pins or exposed wire will work in many cases. I sure hope so both sides need smaller pins , HELP ! Searches related to the Crutchfield Speaker Wire Single 14-gauge speaker wire with pre-attached banana plugs.